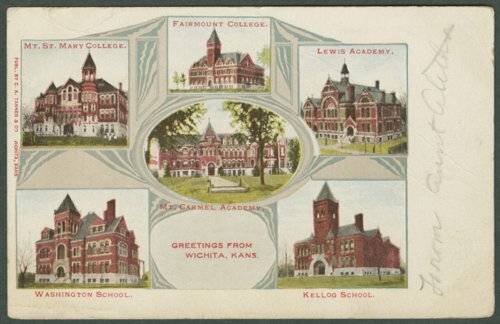 This is a postcard with six images of schools in Wichita, Kansas. The schools are: Mt. St. Mary College, Fairmount College, Lewis Academy, Mt. Carmel Academy, Kellog School, and Washington School. The postcard was addressed to Miss Nellie Felver in Batavia, Illinois.